It’s the holidays and I am getting started a little later than I wanted to with writing about the holiday programs I am watching. I guess I got all tuckered out from the video tape trading articles I did. Every year I devote the month of December to watching randomly picked British television but they have to have some sort of Christmas theme to it. It’s funny because I never seem to pick the series that I think would be really good to show this time of year but I am generally pretty satisfied with what I pick. As long as it’s not the Star Wars Holiday Special, then I am alright. 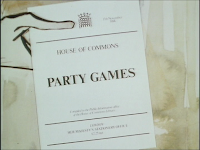 Once I decided to start taking the month of December as nothing but Christmas programs, one episode came to mind immediately and that was Yes Minister, Party Games. I wrote about this episode in a more compressed way back in May as I picked it as part of my article on Memorable Final Episodes. This episode accomplishes a lot in an hour. It is a partial Christmas episode, it is a partial New Year’s episode, but most importantly it takes our character Jim Hacker and elevates him to Prime Minister. Obviously, I did not see this on transmission on BBC2 back in 1984. It would be interesting to know if viewers had any idea that this was going to happen. When watching the episode from the beginning, it gives no indication that by the end of it that Hacker would be the political leader of the UK. Yes Jim Hacker! How do we get there? 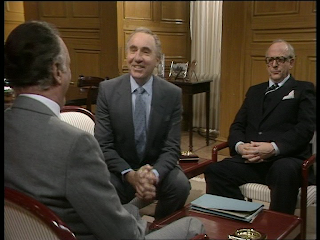 It had been nearly 2 years since we had last seen Hacker, Sir Humphrey, and Bernard with the end of Yes Minister Series 3. I have said it before; this is what I love about British television. A series can disappear for a few years but come back as if nothing has happened. It’s kind of like real life, we lose touch with people but then we get back together with them as if nothing has happened. Well it appears like nothing has really happened with Jim. Some of his duties may have changes a little bit but he is still a cog in the political machine with Bernard Woolley still with him. There is an absurdity within the series that makes this so much fun to watch. It is probably even more fun since the absurdity is only mirroring real life. After all this is a satire. There is much going on here that rings very true with the politician at the time. There is a reason why this was Prime Minister Thatcher’s favourite series. The first absurdity is the sheer amount of holiday cards that Hacker needs to sign and based on who the cards are going to Hacker will need to sign the cards differently. There is something else that is troubling Jim. The European Commission, based on new European regulation, wants to have the classic British sausage to be renamed the Emulsified High-Fat Offal Tube. Hacker knows that this would be very unpopular, especially for him politically. For Sir Humphrey, things are going a bit better. Humphrey is meeting with his boss and mentor Sir Arnold. Sir Arnold is about to retire and needs to figure out who is successor is going to be. You see, Arnold needs someone who knows how to ask the “key” questions. Humphrey certainly knows how to do that as he asks Arnold if he has given any thought to what he was going to do after he retires? This question is more to do with what sort of key chairmanships that Humphrey could line Arnold up with that would yield very little work but a ton of money. Arnold likes his thinking and puts forward Humphrey’s name as his successor. In this episode, as in any other episode, any scene with Humphrey and Arnold are gold. There is nothing likeable about either character yet they are immensely likeable. I also enjoy the dialogue between them as if those two alone are the ones running everything and everyone else is basically window dressing or game pieces moved around strategically. When it comes time for Humphrey to tell Jim about his new role, Jim mistakes it as if Humphrey is dying. “Humphrey, you’re so terribly brave!” Finally Jim catches on congratulates Humphrey on the accession to Cabinet Secretary. "So Humpy, you are going do to the Prime Minister what you have always done to me......for me." They both decide to let the other staff members know about this new appointment at the Holiday drinks party. At that party, we find an incredibly drunk Jim Hacker. Everyone else drinks at that party with more control but Hacker is really letting it loose. He gives a speech about Humphrey which is pretty incoherent and is just a general mess. He decides to drive home even though his wife Annie begs him to allow her to drive. Because this is all just good comedy and instead of this turning into a “very special episode”, the next shot is of the Hacker’s driving down the street going about 5 miles per hour. The police pull him over and give him a verbal warning after finding out who Hacker is and what role he has in government. 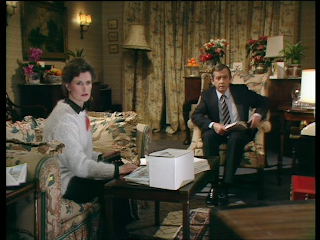 Bernard Woolley: Minister, I've heard something quite different. Bernard Woolley: That there is £1 million worth of diamonds from South Africa in a Downing Street safe, but of course it's only a rumour. Jim Hacker: Is that true? Jim Hacker: So, there ARE all those diamonds in Downing Street! Jim Hacker: You just said there were. Bernard Woolley: No, I didn't. Jim Hacker: Yes, you did! You said you'd heard this rumour, I said is it true, you said yes! Bernard Woolley: I said yes, it was true that it was a rumour. Jim Hacker: You said you heard it was true! Bernard Woolley: No, I said it was true that I heard it! Annie Hacker: I'm sorry to cut into this important discussion, but do you believe it? Jim Hacker: I believe I heard it. Oh, about the diamonds. No. Annie Hacker: Is it impossible? But the real reason was that the Prime Minister couldn’t stand the Home Secretary who would have been a real contender to hold the Prime Minister office. Now that the Home Secretary is out of the picture the Prime Minister felt that he could resign. Of course Jim knows right away that there are two contenders for the office, Duncan and Eric. In fact, they each meet with him right away. Since Jim is Chairman of the Party, his support would mean a lot to either of them. In fact, they each go as far a threatening him with bad positions within the government if he does not support either of them. Meanwhile, Arnold and Humphrey are meeting about who should be the next Prime Minister. They come to an amazing conclusion. Instead of going with the two contenders who are currently on the table, why not find someone who has no firm opinion and could be moldable….. Finally, the Chief Whip asks if Hacker had any thoughts of doing the job himself. This is a great scene because a lot of what Jim is doing in this scene is exactly why Humphrey and Arnold thought he would be perfect for them as Prime Minister. When he is told he can look into the MI5 files of Eric and Duncan, he whips out his glasses and is as happy as a child with the thought of looking into someone else’s files. Then, after Hacker is warming to the idea of becoming Prime Minister, he is not sure what he should do or how he should respond to questions. Humphrey is, off the top of his said, saying how Hacker should respond to press questions at which point we cut back to Jim writing down all of what Humphrey is saying word for word. Also in this scene playing Chief Whip is James Grout. I adore James Grout especially as Granville in All Creatures Great & Small. Everything I have seen him in makes me smile. Jim meets with both Eric and Duncan to get them to bow out of the race. These scenes show us a pretty strong Jim Hacker who takes care of business with both of them. Now, Jim needs to get to work with campaigning for Prime Minister without campaigning for it. He needs to pick something that can be a victory for him. He chooses his battle to save the British Sausage. He creates the illusion to the public that the British Sausage is to become illegal under European regulation. He invites the press in for an impromptu conference in his office to alert them to this horrific turn of events. He eventually gives a passionate speech that is covered by both the BBC and ITN condemning the EEC for making the British Sausage illegal. Hacker speaks with the cadence of Churchill and is actually pretty dynamic. He has a ton of energy in the scene and there is a very realistic feel to that speech. Of course, little does everyone know that Hacker and Humphrey have already met with Maurice from the EEC in which Maurice agrees that they do not need to call the British Sausage the Emulsified High-Fat Offal Tube but it can have the name of the British Sausage. Hacker even gets an interview with the great British news personality, Ludovic Kennedy. Things are serious. Finally, Hacker is called into Humphrey’s office where he is informed his party is voting to see if there are any other candidates to will oppose Hacker for the office of Prime Minister. After Hacker is confused by multiple ringing phones in Humphrey’s office, Hacker is confirmed as the next Prime Minister. This episode is a triumph for the series. A lot of the episodes show Hacker and Humphrey on different sides of all the issues and forcing out a compromise only to get one or the other out of trouble. This episode sees both of them working together. Humphrey is still scheming to get his way. He doesn’t want Jim as Prime Minister because he respects him. He feels like Hacker will allow him to run the government the way he wants to run it. There is a great feel to the whole episode and what I love about this series is that there are a lot of people running out to different buildings for meeting. People are driven around in other cars to other places and there is a feeling of busy-ness and procedure which I guess adds to the absurdity factor. I hate to keep bringing this back up but I was amused with myself while reading my blurb on this episode for the Memorable Final Episodes article. Once again, I think of Yes Minister and Yes, Prime Minister are two separate series with the same characters. The premises are different. Yet, in my article from May 26th 2012, I clearly forgot my stance on this oh-so-important issue. If I may dare quote myself, “I know I went through a big argument about how Yes Minister and Yes, Prime Minister are one series. 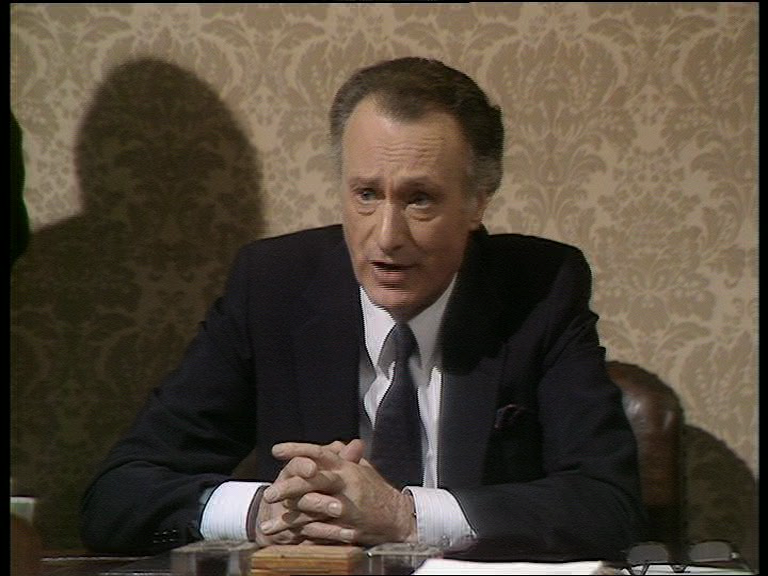 I still do look at it that way but this is the final episode of the series to say Yes Minister on the titles but more importantly it is a transitional episode.” Maybe I should be in politics since I apparently waffle back and forth on this. I even link back to an article where I state that I see this as two separate series which I still do! Let’s see where I stand the next time I look at one of these episodes! As I also mentioned in the article was how difficult it was to get a hold of a copy of Party Games. On KTCA here in Minnesota, it was years until this was broadcast. It may have been the late 1990s but I think it was actually the early 2000s. I assume the reason this was never imported over here was because it was an hour long episode opposed to the usual 30 minute episode? Here is a possible different theory, knowing how BBC sales, or Lionheart back in the day worked, it’s possible that the episode was available but maybe the station had to pay extra for it. The episode started to show up in syndication after Lionheart went away and programs were starting to be distributed by BBC Worldwide Americas. Of course, that is a theory and probably not a very good one. Party Games was shown over here in the late 1980s but not on PBS but on A&E. If I may jog people’s mind here, it may be hard to ever remember an A&E (cable channel in the USA) that did not show Storage Wars, Dog the Bounty Hunter or Gene Simmons Family Jewels. At the very beginning, they showed a great deal of British television. Amongst it was Yes, Prime Minister. Wait though, I was talking about Yes Minister. 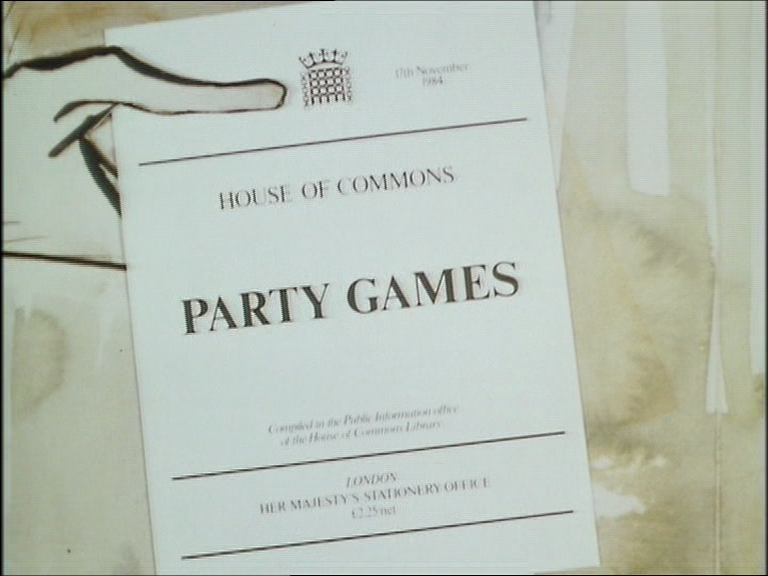 Well, when A&E started to show Yes, Prime Minister they started with Party Games as the series’ first episode. They went even as far as editing the Yes, Prime Minister credits over the proper credits. I didn’t get the episode of Party Games until the late 1990s for my collection and it was a 3rd or 4th generation VHS copy from the A&E broadcast. Because I am odd, I went about to edit back in the proper Yes Minister opening credits as well as take out the commercial breaks. When I watched it just recently, I can still remember where some of the commercial breaks occurred. I watched this episode from the PAL DVD of Series 3 where the episode is included. It’s where it should be included. 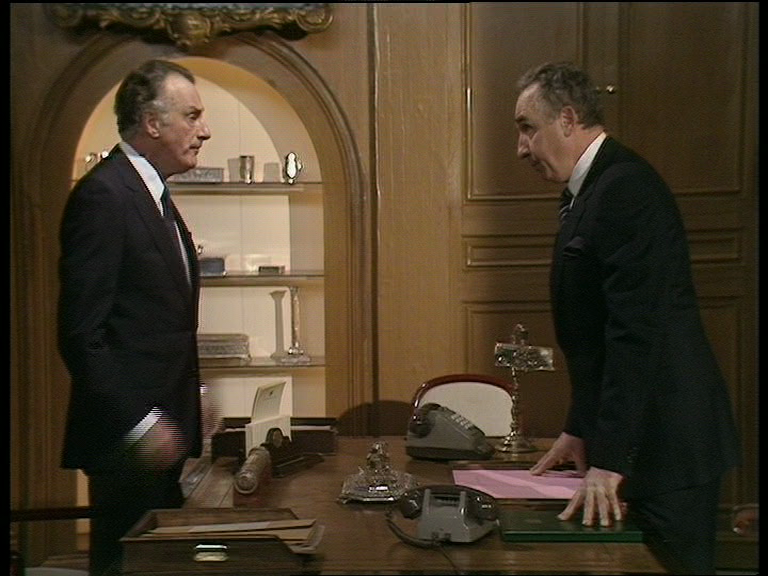 It is the last episode of Yes Minister. 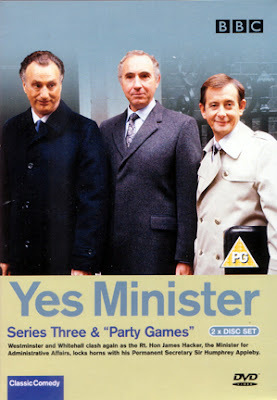 I am surprised and annoyed to see it is included in the US on the Yes, Prime Minister DVD set and not the Yes Minister DVD set. That is ridiculous! I sincerely hope that it at least has the proper Yes Minister opening credits. Please tell me they do! I personally prefer Yes Minister over Yes, Prime Minister. When I did some research to see how Party Games was released on VHS and DVD I forgot a couple of things. First off, Yes, Prime Minister had been released on VHS for quite some time. Out of the two series, that one was released first over in the US & UK. 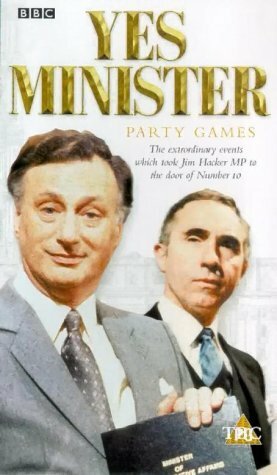 Yes Minister was released on VHS in the UK starting in 1994 but didn’t finish until Party Games was released in 2001. 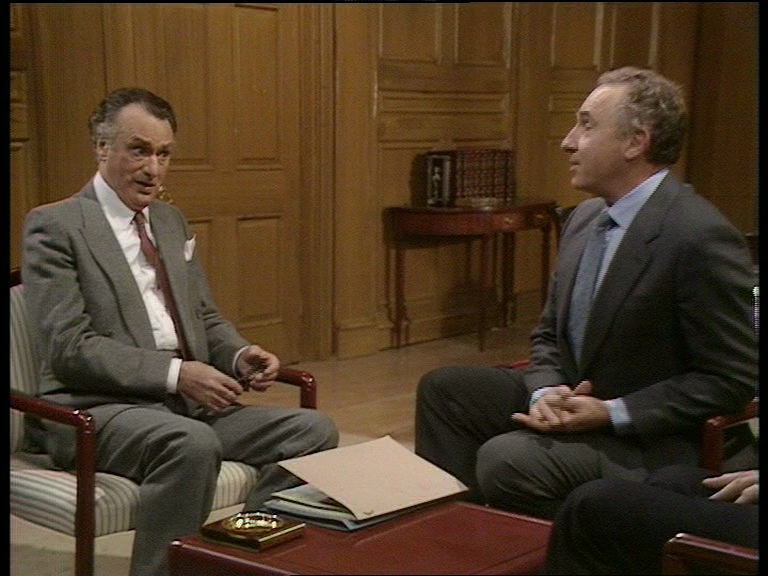 In the US, Yes Minister came out in 1998 on VHS but only the first series. Party Games pressed all the correct buttons for me. It’s a great transitional episode that had a holiday theme without being overly Christmassy. To be honest it is probably one of, if not my favourite episode of the entire series. There are so many great quotes and so many great moments. Of course, they all returned in 1986 with Yes, Prime Minister. I wrote an article about the first two episodes of that series in 2011. Do you want to see it, please check it out here. The script quotes from these episodes were found on www.yes-minister.com and IMDB. Next week: Even though it will be after Christmas, let’s fit in one more holiday program. I look at an episode of Hancock’s Half Hour called Hancock’s Forty-Three Minutes. Do the extra 13 minutes help this episode? Back in the dark days, I bought myself the VHS tapes of Yes, Prime Minister. I was quite a while before I knew that Yes, Minister even existed, much less had a chance to see the episodes. It was much later still when I finally got to see Party Games. It was a gem then, and is still a gem. On a side note, I am quite apprehensive about the upcoming revival/return of YPM. I suppose I will give it a shot, but can it live up to the standars of yesteryear? I am sure KTCA showed Yes Minister back in the 1980s but I always figured, as I was young, it would be too over my head so I was very much a late adopter. For the new series of Yes Prime Minister, I do wish they would have created new characters for those roles. It would have lived so much better in my own mind if these were just different people. I don't want some one else to play Jim Hacker or Sir Humphrey. Sure I will give it a shot but I don't know. Granted, I didn't mind Reggie Perrin but it was no where as good as the original. 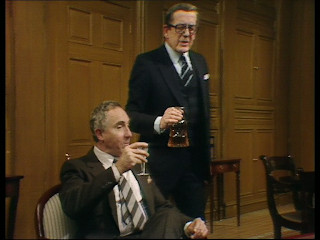 So - just watched the first episode of the new rebooted Yes Prime Minister. If I had to sum it up in one word, that word would be YAWN. Although I was determined to give it a fair shake and watch it to the end, I was checking the remaining time all the way through. The laugh track was annoying and the acting was dire. David Haig has nothing on Paul Eddington, and Humphrey and Bernard just had no redeeming qualities. The script itself was ok, but it had no chance given the so-called acting. At this point I am not sure I will even bother with the following episodes, but I probably will out of a sense of duty. Still, once it is all over I may very well have to get out the dvd and watch the real thing to get rid of the foul aftertaste. Hope this didn't come off as too negative, but I am not sure you can be too negative about this sad excuse for a comedy. I have to admit that I am impressed you even watched it. I might give it a try but I really don't have too much interest. I am completely happy to enjoy all those episodes of Yes Minister/Yes, Prime Minister with Paul Eddington and Nigel Hawthorne. I understand they showed one of the classic series episodes prior to the new one which I can't imagine helped matters at all. From the classy theme music to the end credits, Yes Minister exudes quality. The acting is reserved, the writing incisive and the situations never unbelievable. The set up is more or less the same every week, with Jim Hacker getting on his high horse about some misdemeanor or breach of procedure and then getting hoist by his own petard when he has to resort to similar skullduggery to save his own skin. Sir Humphrey always sees this coming and quietly uses the situation to his own advantage, with the final line from Humphrey's lips: 'Yes, Minister'. Bernard was always stuck in the middle, but usually had his own gem of wisdom to help (usually) Hacker get off the hook. Three seasoned actors working together like a well-oiled clock and a supporting cast of well-known stalwarts of the time made for excellent viewing.